My source vCenter called ac-vcenter-1.purecloud.com. This has access to my source FlashArray and its VASA providers. My target vCenter called ac-vcenter-2.purecloud.com. This has access to my target FlashArray and its VASA providers. My PowerCLI version is 11. Make sure you are at least running this release–there are important updates that make this process simpler. Older revisions require a few more steps. The “SPBM” cmdlets do not shut down VMs on the source side. Manipulation of VMs (other than making a copy accessible on the target site) is out of the scope of the VVol failover cmdlets. The “SPBM” cmdlets do not power-on or register the VMs on the target side. These “SPBM” cmdlets are solely about getting the VMs available on site B. Though I will give examples on doing this part. Make sure the VVol datastore is mounted somewhere in the recovery site. You also of course need the source mounted somewhere too, but I figure you’ll have that done. No datastore = no VMs. 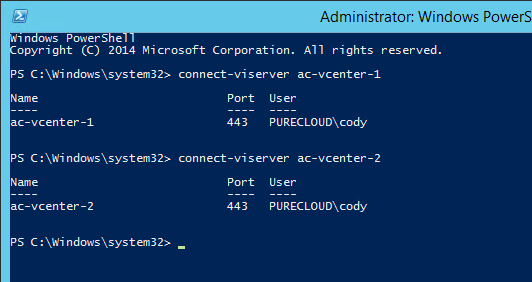 Register VASA from both arrays in at least their respective vCenters. Configure one or more VMs on the source VVol datastore. Assign them a SPBM storage policy that includes FlashArray replication. If you manually assign them to replication groups on the array instead of using storage policies, this process will not work. Pro-tip: assigning features like replication via SPBM not only tells the VMware admin how they are configured, but also tells vSphere how they are configured. First things first, connect to both of your vCenters. What if I am failing over my VMs inside of a single vCenter? Well that’s fine of course–just connect to just the one vCenter in that case. The key is: make sure that your target and source VASA providers are registered to the vCenters that you need to use them with. If you have two vCenters, make sure that your target VASA providers are registered to the target vCenter and your source VASA providers are registered to your source vCenter. If you are using one vCenter make sure that both your target and source VASA providers are registered with that vCenter. The next step is to identify your TARGET replication group that needs to be failed over. VVols fails VMs over in the granularity of a replication group–and this is what is passed to VASA to tell the array to bring up the appropriate storage. There are source replication groups and target replication groups. On the FlashArray, replication groups are 1:1 mapped to what we call a protection group. A protection group is a consistency group with (either or both) a local snapshot policy and/or a replication policy. If the protection group does not have a replication policy, it will NOT have a target protection group. You can simply list the replication groups, or you can use some kind of source object to get the relevant group (or groups). Note–if you DO NOT see the source group you are looking for, you likely are connected to only the target vCenter and NOT the source vCenter. Make sure you are connected to the source vCenter too if you are failing VMs between vCenters. That will return the replication group that the VM belongs to. And choose your source group from those. The choice is yours–it doesn’t really matter what you choose as your journey to get the replication group, just that you identify the one you want. FlashArray source replication groups are named by the array name, followed by a colon, followed by the protection group name. Target group names are named by a UUID and replication group number. To run a test failover, you need the target group, so how do we get the corresponding target group from the source group? 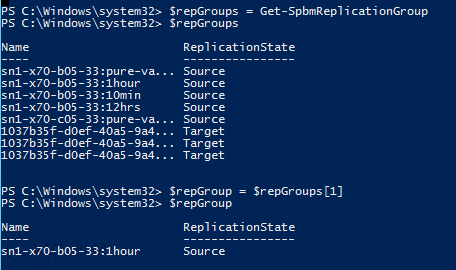 I can then pass that into get-spbmreplicationpair to get the replication group pair. Pass that $repGroup into the -source parameter. At this point I can run a test failover–nothing else is needed. But there are some option parameters. So let’s take a look. The next step is optional. Do you want to failover to a specific point-in-time? If you do, you can query the available point-in-time’s available. Otherwise, skip this step. Above, I store all of my available point-in-times in $PiTs then index to the one I want and store it in $PiT. So during the test failover command, I can specify $PiT to make it failover to that point-in-time. Q: Do I have to shut my source VMs down? A: Well, no, but I presume you would want to. IP conflict, application conflicts, etc. I highly highly recommend shutting them down first. If you aren’t shutting them down, this isn’t really a failover. Smells like a test failover and in that case you should be following that process. Q: Do I have to unregister my source VMs? A: No. Though having them registered but powered-off runs the risk that someone might turn them back on. But unregistering them is not the option I would go with, instead I recommend just deleting them. Why? Well if you just unregister them, it is possible you could forget them there and there would be some stranded VMs on the FlashArray that take up space and volume count. Q: Do I have to delete my source VMs? A: Also, no. But I do recommend it. Even when you delete them, you can restore them for up to 24 hours. And since you are failing over, they will be brought up on the other side anyways. One option though is the shut them down, do the failover, then once successful, then delete them from the source side. Q: Should I, and if so–how do I, synchronize my VMs before failover? A: Well however you want, via our GUI, wait for a replication interval to happen naturally, or use tools like PowerCLI. See more information about that here: https://www.codyhosterman.com/2019/02/powercli-and-vvols-part-vii-synchronizing-a-replication-group/. In the end, make sure that things are synchronized before a failover. This will make sure things are recovered just as they were then shut down. The last step is to run the failover. Nothing too exciting here. Our friend start-spbmreplicationgroupfailover. Not much is required here. You can pass in your point-in-time if you want, otherwise it will just use the last full point-in-time available on the array. You need to either add confirm, or manually confirm during the operation. You can also run it asynchronously if you want with the -runasync tag. The bulk of the failover time will be VMware updating the VVol datastore pointer files in the various config VVols. When the operation completes it will then return you the VMX path files which you can register. 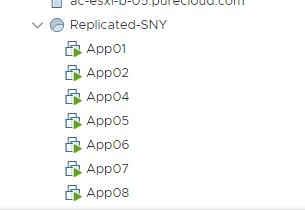 I stored my vmx file paths in the object $vms so the above few lines will register them to a resource pool called Replicated-SNY (in my case). Though if you want to add them a certain folder or pool adjust as necessary. 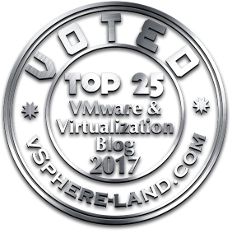 This will also be the time to change VM networks etc as required in your environment. Then power them on. I stored the resulting VMs in my registration process in a variable called $registeredVms. You might need to answer boot up questions (was this copied/moved) which you can answer with the get-vmquestion cmdlet. So now that we are failed over, you probably want to re-protect your VMs back to the original site. You can of course protect them to any where you want, but here I will walk through what I believe to be the most common option, which is replicating them back to site A, the site you failed over from. 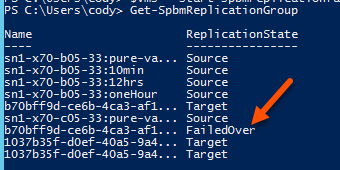 So what does Start-SpbmReplicationReverse actually do? Really just one two things in our (Pure) case. First off, when reverse is run we change the state of that target group back to target. So the replication is reversed and the VMs are protected back, but VMware is not “aware” of it. You need to assign a storage policy. 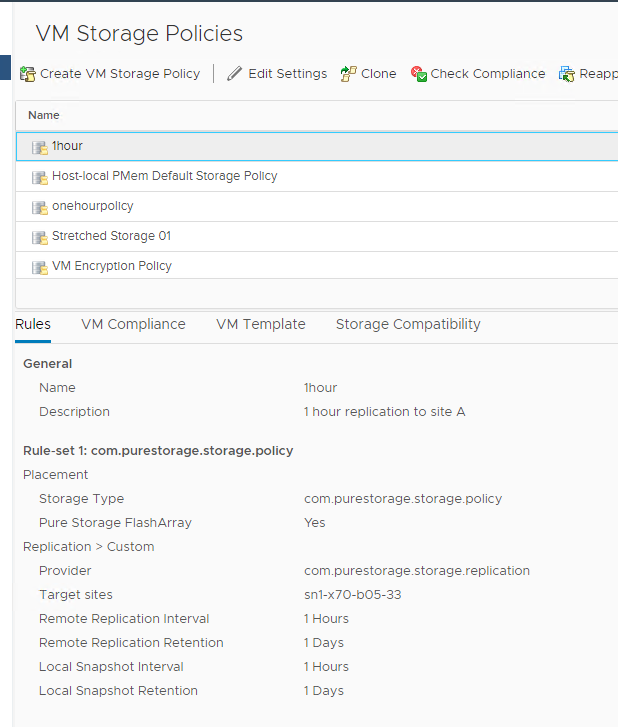 On my recovery vCenter I have a policy called 1hour that requires the VMs in it be replicated back to my site A array every hour (amongst some other requirements). So let’s assign that. I will get that policy via PowerCLI. I can then use the cmdlet set-spbmentityconfiguration to assign the policy. We can see the policy is now set and the VM is compliant! Since the VMs are already in the protection group, VASA doesn’t actually have to do anything to the VMs, but now VMware *knows* that they are protected. And can now fail them back etc. So my full script is below. I plan on making this much more reuseable and adding it to my PowerShell module. Which will streamline this a bit more. $sourcePolicyName = "<source policy name>"
$targetPolicyName = "<target policy name>"
$resourcePoolName = "<resource pool name>"
$targetvCenter = "<target vCenter FQDN/IP>"
Previous PostPowerCLI and VVols Part VII: Synchronizing a Replication GroupNext PostNVMe-oF Support is now Released!